Provides an easy way to browse and view movie and TV show extras. Extras can be accessed from the context menu in the video library. By default, the add-on will look in the "Extras" sub-folder for content (can be changed in settings). By default, the add-on will look for the folder named "Extras". The name of this folder can be changed in settings but you can only use one name. The location of the Extras folder is important as failing to locate the folder correctly will return an empty listing with only a youtube link. The Extras folder must be located in the same folder as your video file. Some typical examples are listed below. You are not able to use Extras per individual episode. Extras for a TV Show are located within the main TV Show folder. If you have followed these instructions correctly, selecting Extra's from the Context Menu should return a display similar to this. Extras are video files the same way the main feature movie is a video file. 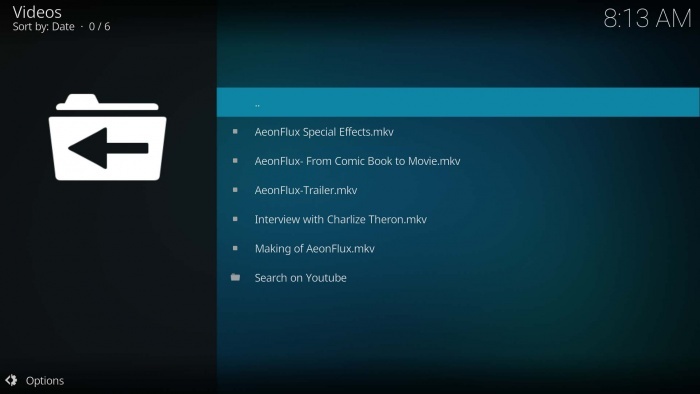 This may cause Kodi to see your Extras as additional movies. To prevent each Extras video file being scraped as a movie, and adding random or duplicated movies into your library, you must tell Kodi not to scrape the Extras folder. A number of methods are available. A listing is found here Excluding folders and file types or use the Advancedsettings.xml method using the code below by simply copying and pasting the following code into your Advancedsettings.xml file. If you already have an advancedsettings.xml file, do not duplicate the <advancedsettings></advancedsettings> tags. In previous versions it could also be accessed via the Movie Information page, but has been removed from v17. Change this to Play to prevent Kodi from scraping instead of playing. If you experience any issues with this add-on, click here and post details of the issue to seek further assistance. This page was last edited on 21 April 2019, at 23:22.